Ma lai, meaning flower is a beautiful Faery spotted in the lush forests of THAILAND. 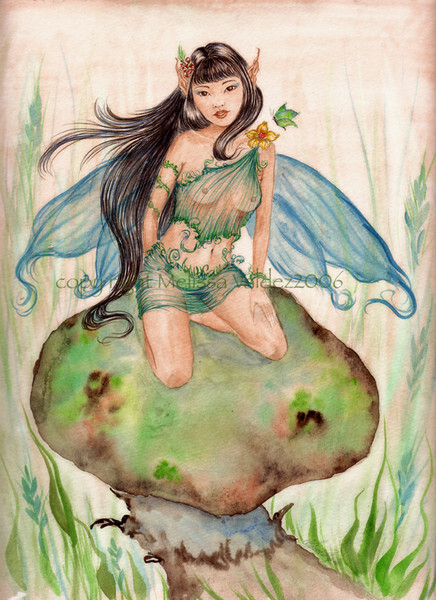 Captivated by the intense green around me, the sweet smell of the earth and the thick moisture in the air, I felt a bit lightheaded, not realizing the familiar feeling come over me, butterflies were fluttering in my stomach, my hands begun to shake...to my excitement, I realized faeries were in my presence. I couldnt believe it, I felt memorized. I knew I couldnt look for them, they had to appear on their own, I sat on the moist earth closed my eyes, and lost all thought, flickering Lights appeared beyond my eyelids, I suddenly became very warm and relaxed. My eyes felt heavy; I opened them and then GASP! There it was, kneeling ever so proudly on a mushroom, Tiny, Beautiful, Exotic, her eyes locked mine, and what struck me was, her wings, electric blue! Among all this green, I found it odd. Faeries usually adapt to the colour of their environment, this one wanted to be seen. I thought I would burst with excitement but I remained calm, she kissed my forehead and swiftly fluttered away leaving a trail of blue in her path& as I watched her fly away she gave me a glance and winked at me, she knew I believed&. I felt blessed&Happy was I in this moment.. I love the hair, and excellent detail! Great piece of watercolor rendering! Very Lovely!!!.. Love your color choice too! !